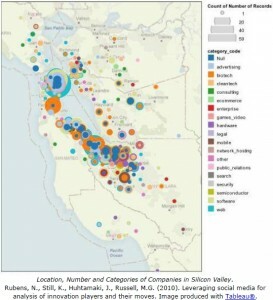 IEN analyses federated data by using new tools for measuring and mapping innovation success factors, networks and flows of knowledge, money and ideas. In addition, real-time and close-to-context visualization is used to create a meaningful understanding that can be shared with constituents. Overall, this data-processing pipeline allows for more effective decisions and strategic interventions in sustainable 21st century innovation economies. Tools used by IEN include NodeXL, Vizster, Wille, and Tableau®. Network Analysis. 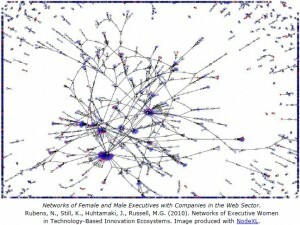 One of the tools used for network analysis examines social networks. Social network analysis is a research field studying of network of social actors. 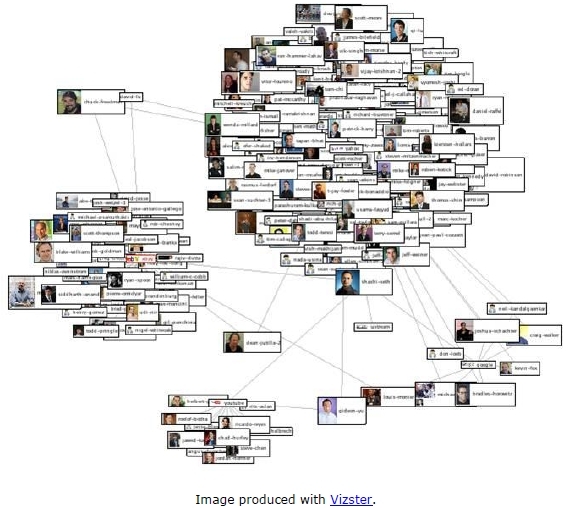 There are a number of tools that permit the visualization of social networks. The use of graphic images to represent social configurations is important because “[i]t allows investigators to gain new insights into the patterning of social connections, and it helps investigators to communicate their results to others” (Freeman, 2009). IEN approaches social network analysis from data-driven information visualization point of view, thus we refer to data-driven visual social network analysis. 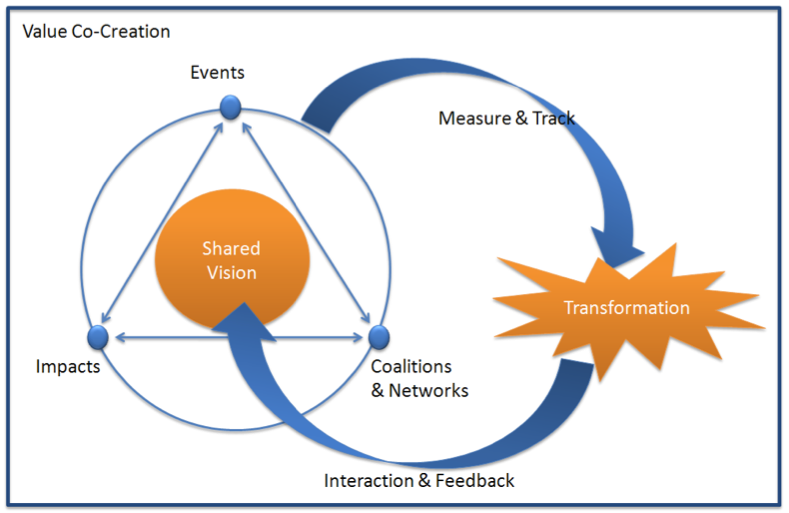 To measure dynamic systems, we use a metrics system of actors and events (people, events, things that can be counted), impact (the changes in the quantity of those events because of interventions), new coalitions (linkages and networks among the actors and events), and shared vision (mental models embraced by coalitions.) A systems approach allows us to embrace the multifaceted nature of innovation. At various levels, national innovation systems, regional innovation systems, technological innovation systems and sectoral innovation systems are the result of interactions among a number of actors, who are influenced by interrelated determinants of innovation processes. Interventions in innovation systems (policies, programs, resources) are designed to build capacity and capabilities – in acquiring know-how, transitioning it for application and supporting the growth of the participating organizations. Linked data. Quite often, the most resource-consuming step in setting up of data mining and information vizualisation processes is gaining access to the actual data. To tackle the problem in IEN, we are adopting the principles of linked data in managing and representing the IEN federated dataset and to provide uniform means to access the data. This allows us and other IEN dataset users to more easily create the kinds of projections of the data that meet the needs posed by the analysis. Time-series Analysis. Impact and shared vision require time series analysis, and the relevant time frames for measuring innovation ecosystems span a range of objectives. Metrics for impact require multiple points in time – in order to reveal changes: numbers of new companies, new products, investors; growth in sales, investments, employment. Similarly, metrics for shared vision gain dimension when compared over time. While being able to see static visualizations of the different aspects of innovation ecosystems is already are a very powerful tool, the temporal dimension quite often adds to the insight. On basis of time-series data, we are able to provide insight and analyze the evolution of innovation ecosystem over time. Revealing changes in numbers of new companies, new products, investors; growth in sales, investments, employment as well as the development of the structure of social connections within the ecosystem all require the existence of the temporal dimension in the data and the analysis.